When Dublin taxi driver Paul Clooney told his work colleagues that he was going to ditch his then favourite car brand after twenty years and make the switch to a Nissan LEAF EV he was greeted with the same response - ‘you’ll never make it work’. 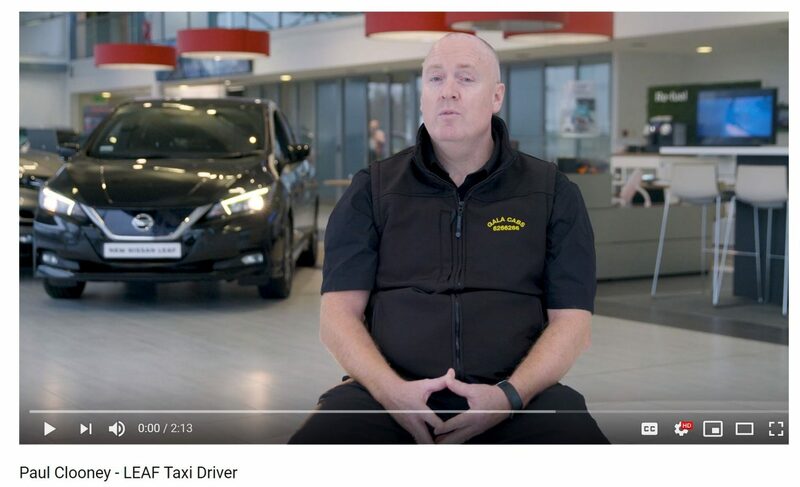 As a taxi driver working 12 hour days, driving up to 2,000 kilometres during working weeks and an average of 70,000 kilometres a year, Paul was not surprised when his fellow drivers at Gala Cabs in Lucan challenged him on the wisdom of buying a 100% electric vehicle for use as a taxi. “A lot of taxi drivers said to me that I’d never make it work, but I’d done my homework. It’s been a superb investment for me. Over the year the car will save me around €13,000 between fuel and service costs,” said Paul, who is now one of the world’s most influential Nissan LEAF drivers. Paul was first attracted to the LEAF by the €10,800 in Government grants that are currently available to SPSV drivers who make the switch to a new EV and by the potential to wipe out both the €8,000 to €10,000 he was spending on diesel and €4,000 he was spending on car servicing each year. Paul likes to work twelve hour days for ten months of the year so that he can enjoy two months off with his wife and three kids each summer when the family fly out to their apartment in Fuerteventura, Spain. Paul is based on the taxi rank at Liffey Valley Shopping Centre and starts his 12 hour shift at 3.30 a.m. each working day. As a successful businessman Brendan O’Sullivan (47) clearly has a great nose for a deal and an even sharper eye on how to manage costs as he travels to client meetings the length and breadth of the country. His thriving software development business is based in Bray, where he also lives with his wife Mairín, and hardly a day passes where he is not travelling at least 100 kilometres to meet and service the needs of a growing customer base. 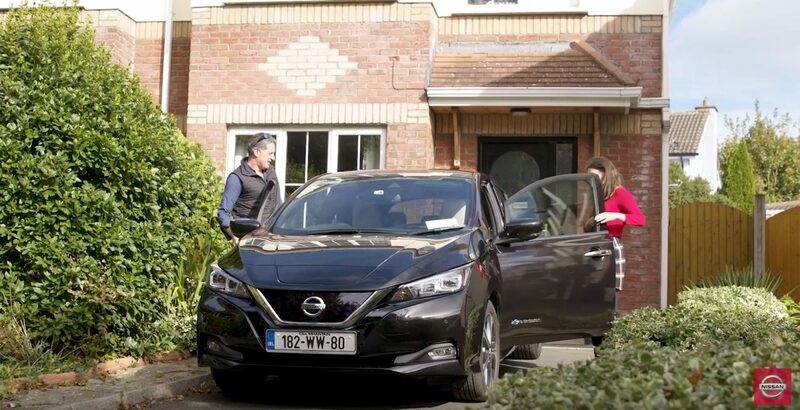 Making the switch to the fully electric Nissan LEAF was a ‘no brainer’ for Brendan who describes himself as an ‘evangelist for EV driving’ having experienced the savings and thrills of zero emissions driving. While his decision to buy the Nissan LEAF was environmentally motivated, Brendan was also influenced by the removal of BIK on electric vehicles, the potential to reduce his car running costs and by an abundance of free public charging points in Bray. “I am all for evangelising as much as I can. The best way to convince people to switch to driving a LEAF is to show them the savings. The way I’d put it to people is simple – why do you want to spend that money on petrol and diesel when you can drive electric for almost nothing. It’s a no-brainer”. As a busy businessman Brendan needs to be certain that his LEAF can take him where he needs to go when he needs to get there. Range was something he was curious about before he bought the car, but he explains that it is no longer an issue. Those long trips up and down the country have also been made easy by the state of art technology in the car. An EV-angelist he may be but Brendan has one small complaint. “The biggest gripe I had – and it was probably the great summer that brought it home – was that it’s not a convertible. I’ll never go back to petrol or diesel, but I’m certainly open to buying the first convertible LEAF!”. With eight grandchildren under the age of seven, Stephen and Catherine Yeo appreciate the value of quiet time to themselves but the one place they never expected to find it was in their new Nissan LEAF. The fully electric car is so quiet that is has enabled the couple to soothe grandchildren to sleep, to ease travel sickness and to enjoy all of the dynamics of classical music for the first time while driving. 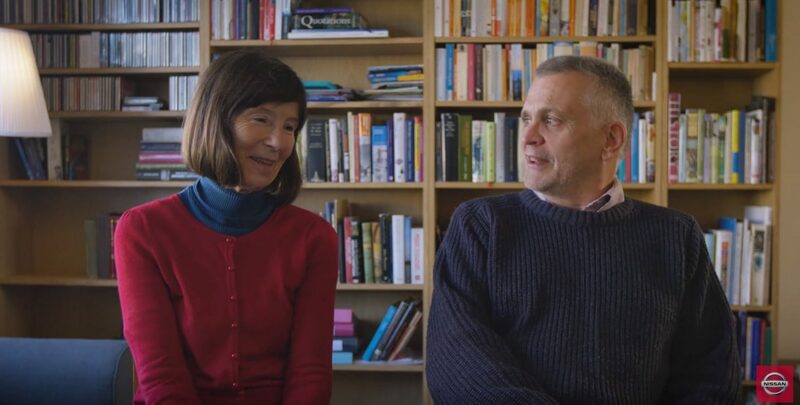 The latter was an unexpected bonus for Stephen who taught music at the College of Music in Dublin and as the headmaster of a specialist music school in the U.K. before the couple relocated to Ireland earlier this year to begin a new life in retirement. The couple were attracted to the 100% EV for a variety of reasons. They wanted a smaller car that could still do longer journeys, but they also wanted a zero emissions car so that they could lead by example when it came to educating their grandchildren about the value of protecting the environment. “We looked at hybrid but decided to go the full monty, so to speak. The government grants towards the cost of buying the car and installing the home charger, cheaper road tolls and the fact that you can charge the car for free outside of home made it an easy decision,” said Stephen. The couple have recently welcomed their eighth grandchild to the family and divide their time visiting their son and his family of four children in Dunshaughlin in county Meath and travelling back to the U.K. where their three other children and four other grandkids reside. “We commute between Dundrum and Dunshauglin and we also taken the car to the U.K. travelling to York and south-east England. We’ve been surprised by how quick and responsive it is. We’ve put quite a few miles on the clock since we bought it in August and it has cost little or nothing to drive”. “I’m not one for charging along the motorway or the M50 at 120kph. I tend to go along at around 80kph and I’m getting 220kms to 240kms out of it without ever letting the battery go lower than 10% or 15%. If I have to make a long journey then I would not start out with less than 30% or 40%,” said Stephen. Stephen and Catherine’s frequent trips to Dunshaughlin and to the U.K. have led them to experience the many different ways of charging their LEAF. The couple have also been impressed by the ePedal technology which enables them to accelerate, brake and come to a complete stop with one pedal and by how easy it is to park the car in multi-story car parks and busy city centre locations. “We’ve been surprised at how quick the acceleration has been. It is incredibly smooth and you do not get any surge when you change gears or brake. Anyone who has driven an automatic will not be thrown by it. It is better than the automatic car we had for the last decade”. The numbers never lie and this is something that software developer Aleksei Jusev knows all too well when he turns on his iPad to display the Excel spreadsheet that he has rigorously maintained since the day that he collected his new Nissan LEAF. “I did 10,000 kilometres in the car in the first two months. That cost us €100 in electricity, or 1 cent for every 10 kilometres. If I drove the same distance in my old petrol car we would have had to fill it up 12 times. That would have cost us €840,” he explains with the swipe of a finger. 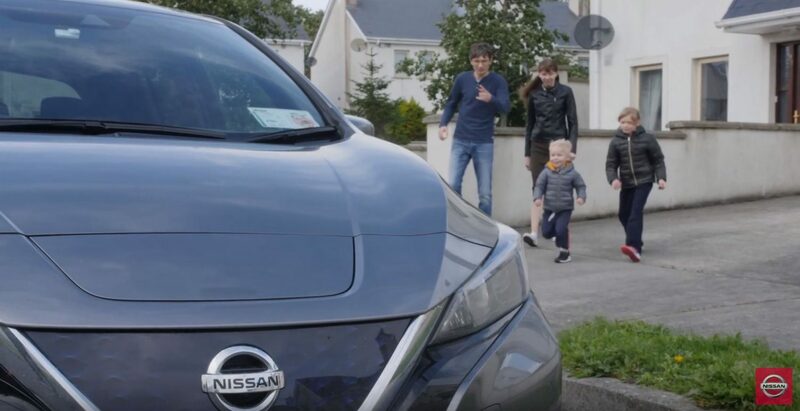 That freedom of being able to jump into their new EV and to take off whenever they please has made an enormous difference to the quality of life that Aleksei (29) enjoys with his wife Tatjana and their two young children Evelyn (7) and Alex (3). Aleksei generally charges the family’s LEAF at home having installed a 7kWh home charger but is no stranger to plugging in the three pin ‘granny cable’ when he needs to top up the battery on visits to family and friends. The car has also proven to be a hit with their young children who love how quickly it accelerates or “rockets”, while Tatjana enjoys how quiet the car is, especially when they are travelling as a family at motorway speeds. Aleksei, though, is much more impressed with the on board technology. With 12,500 kilometres currently on the clock of his new Nissan LEAF, Aleksei is close to his first service and while his mileage is excessive for little under three months, he points out that he is making even more savings when it comes car servicing.